You enter a dark room – along one wall is a large moving image. You see an image of a forest. The image is moving slowly and showing a continous and repeating 360 degree pan around the forest. The sounds of the forest are all around you and as you listen you perceive a distorted quality…maybe the sound has been slowed down. 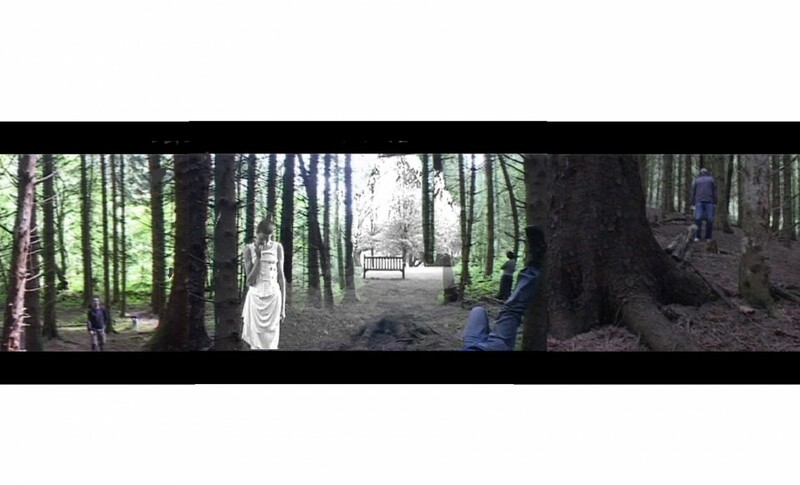 People begin to appear in the forest, mostly in everyday pedestrian clothes – they seem at once to be absorbed with the environment around them, and in their own worlds. Some are engaged in ordinary actions, others in strange ones peculiar to them – as you watch, these become increasingly extra-ordinary, strange and sometimes disturbing. Sometimes the figures appear still and in repose. Their movements appear ‘out of sync’, both strangely dislocated from, and located in, the forest they inhabit. The people appear in different parts of the forest, sometimes almost filling the frame, sometimes so far distant they are only just perceptible. Each is engaged in actions that are particular to them and the sensual, rhythmic and emotional quality of their movement shifts over time. There is an increasing atmosphere of timelessness – simultaneously serene and disquieting.